THE Baseball Federation of Malaysia (BFM) are keen to strengthen ties with the Kyoto High School Baseball Federation. The visitors had a training session at the National Sports Council (NSC) complex in Bukit Jalil and concluded the tour with a friendly match against the Malaysians. Kyoto High School Baseball Federation chief director Akira Inoue said they were pleased to be in Malaysia. “We love the country and the people are friendly. Playing a match with the Malaysians was enjoyable. Winning and losing are part of the game. More importantly, we have strengthened our relationship with Malaysia. We are keen to return to Malaysia for more friendly matches,’’ said Akira. The Japanese team comprised 18 players and three coaches. The head coach was Hideko Harada, one of the most popular baseball coaches in Japan. The Kyoto High School Baseball Federation have been impressive in the Japan baseball league involving 70 teams. Akira said they finished 18th in the league. “Several of our players were picked to be in the Kyoto All Stars. For us, this trip is to build a rapport with the Malaysians,’’ said Akira. 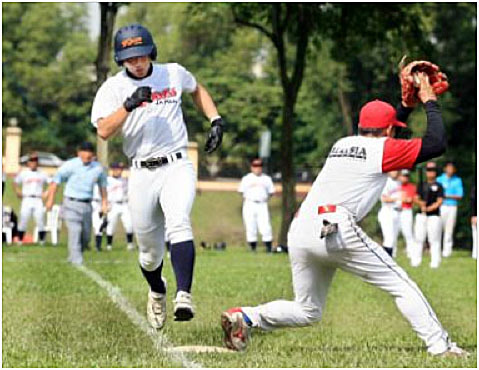 After their stint in Malaysia, the Kyoto High School Baseball Federation held a three-day playing tour in Singapore. Photo1: Having a ball: The friendly match in progress. Photo2: Spirit of sportsmanship: Hideko Harada (No. 21) briefing his players before the friendly match.